LED’s light the way forward. Light Emitting Diodes (LED) have been around since the 1970’s but in recent years they have really come to the forefront of lighting technology. Progress in LED lighting has been driven by the increasing importance of some of the advantages that LED’s have over traditional lighting not the least of which is the growing importance of environmental issues and energy efficiency. LED’s convert 90% of the energy that they use into light. They are by far the most efficient light source available and changing to LED lighting in your pool will significantly reduce your running costs and the associated carbon emissions. The other great advantage is that LED’s have an operating life of well over 50,000 hours; in fact many LEDs made in the 1970s and 1980s are still in service today. In changing to LED lighting you will see a saving in maintenance costs and replacement bulbs and an end to the frustration in changing lights that are underwater or in hard-to-get-at places. It also means that failed bulbs and lights don’t have to be disposed of by putting them to landfill. All in all, your pool becomes much more eco-friendly as soon as you have made the change. And making that change isn’t difficult, LED bulbs are available to fit almost all existing pool lighting. 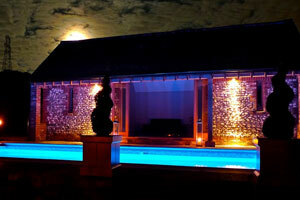 But that isn’t the only reason that LED’s are becoming the most popular way of lighting a pool. The very first LED’s were only able to emit a red light but more colours soon became available. The way that LED’s work – by becoming brighter proportional to the amount of current flowing through them – makes them very easy to control and so modern LED units use a large number of tiny bulbs working together to produce a light of any colour imaginable and one that can constantly change. Digital technology means that LED lights can be programmed to create fantastic light shows. The control unit can store a range of pre-set programs so that the lighting for your pool can be changed at the touch of a button from a setting that is designed to produce a soft, relaxing ambiance to one that gives your pool a party atmosphere. LED lighting is just as suitable for outdoor pools as for indoor installations and is one of the simplest and most cost-effective ways of giving your existing pool a ‘make-over’. And with their lower energy consumption, it’s a way of improving your pool that will also reduce your running costs and save you money. There are, of course, many different brands of LED lighting but EVA Optic are one of the best available. There are few areas with higher requirements of a lighting system than a swimming pool. Heat, moisture and chlorine; it is often underestimated how great the influence of these factors is on the products contained in a swimming pool. Regular LED lighting may not always be sufficiently resistant to the swimming pool environment. EVA Optic developed a range of LED lighting specifically for the aggressive swimming pool environment; the Aqua HE product line. The LED lighting in the EVA Aqua HE product line is durably resistant to chlorine, heat and moisture. They have a complete range of lighting to fully equip every type of swimming pool from linear lighting and downlights to spotlights, wall lights and underwater lights and, when connected to a DMX controller, all the lighting both in and around your pool can be varied to produce just the right colour and mood. Manufactured in Belgium, the Spectravision range of lights transforms any pool into a night time oasis of glowing colourful warmth by combining the vibrancy and brilliance of LED with the soothing effects of colour. The Spectravision lights also can give an ultra white light. Spectravision lights are ultra flat, and can be fitted into either a standard light niche for new pools or into most existing niches for retro-fit. If you would like some specific advice on LED lighting and would like to find an appropriate pool professional in your area, there is a find a supplier link at the top of this article that can get that process started.